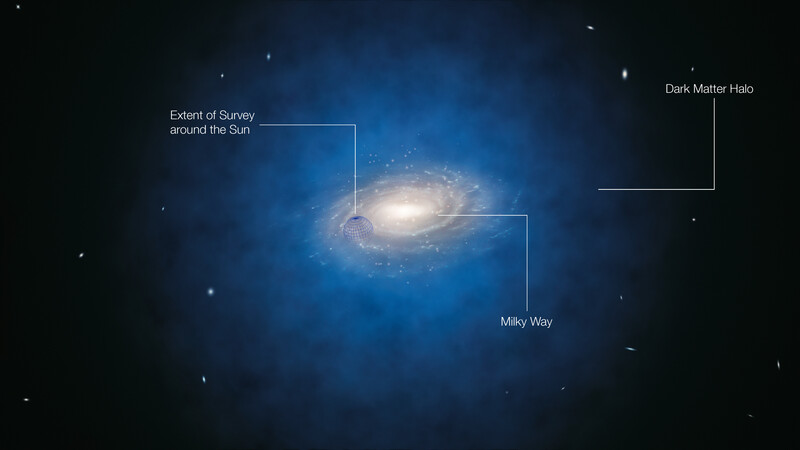 This annotated artist’s impression shows the Milky Way galaxy. The blue halo of material surrounding the galaxy indicates the expected distribution of the mysterious dark matter. New measurements based on the movements of stars show that the amount of dark matter in this region around the Sun is far smaller than predicted and have indicated that there is no significant dark matter at all in our neighbourhood. The blue sphere centred on the Sun’s position shows the approximate size of the newly surveyed volume, but not its precise shape.